First up, the ever brilliant Lighthouse Wines is hosting their first beer tasting event at Bureau by the Lough on Tuesday 6 May. Apparently it's £10 in with 8 beers to sample (none have been announced yet that I'm aware of but give them a follow for more info). Should be worth checking out! Description: Poured a very dark brown with a small tan head. Light coffee aroma, roasted malt, some cocoa, and a touch of dark fruit. On taste I got some smoke and wood to start, coffee and chocolate in the middle, and a toasted malt (and a hint of fruit) on the finish. Creamy and smooth, mid-to-full bodied but a little dryness. Thoughts: Another little cracker from Rogue. Nicely balanced, nothing to fancy, but very drinkable. Then I thought I'd be ticking another beer off the list, but I wasn't! I mistook the Achel Bruin with the Achel Extra Bruin... Ah well, buying a trappist beer is never that big a mistake. Description: Dark brown, hazy, with a small beige head. Not much going on with the smell to start (it needed to warm up a bit) eventually there were hints of plum, marzipan and brown sugar. Starts with a whack of Belgian yeast, followed by dark fruit, marzipan, brown sugar, honey, nutty, and cherries. Quite full bodied, creamy, tight carbonisation. Thoughts: There's a lot going on here, but it needed a bit of heat to get going. Actually there may have been slightly too much going on but overall excellent beer. Now I really want to try the Extra - anyone seen it available? Description: Light amber, decent white head. Wow lots of peach in the aroma with some floral notes too. Taste starts off peach and nectarine, but doesn't really follow through with much punch - a little watery and no real bitterness. Light, low(ish) carbonisation, with a slight syrupy mouthfeel. 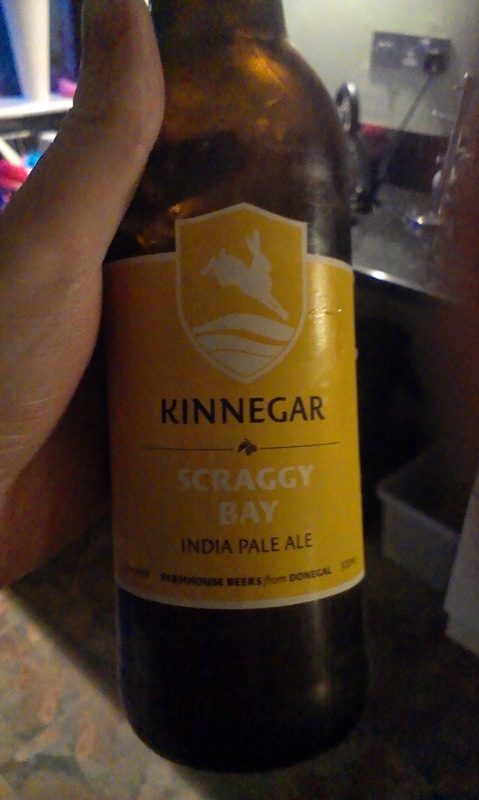 Thoughts: This is my third beer from Kinnegar Brewing, and the first that hasn't done much for me. It's not bad, just a little watery with no real depth - drinkable but not sure I would return to it. Right - I'm off to to restock the beer supply.